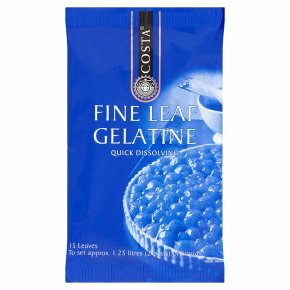 Quick dissolving.Fine Leaf Gelatine is extremely versatile and easy to use. It can be used for the preparation of jellies, mousses, bavarois, dressings and glazes for fish and all aspics. Usage Instructions Soak the Fine Leaf Gelatine in a bowl of cold water for 4-5 minutes, allowing it to swell. Remove from the water and gently squeeze out any excess liquid. The leaf gelatine is now ready to use as directed. For use in cold dishes, place the squeezed gelatine in a saucepan over a gentle heat, stirring occasionally. Once melted, remove from the heat, add the ingredients to the pan and mix thoroughly. When using in warm dishes, add the squeezed gelatine directly to warm liquid and stir until dissolved. Leaf Gelatine can be prepared in the microwave. Simply place the squeezed gelatine in a little bowl and melt on high power for about 10 seconds. Add the cold ingredients to the bowl and mix thoroughly. Hints and tips Never add gelatine to boiling liquids as this will diminish its setting qualities Do not add gelatine to a cold mixture - always add the cold mixture to a pan of gelatine. Add soaked gelatine to set clarified beef chicken or other stock. Use melted gelatine as a glaze to pastry dishes. 2 sheets of leaf gelatine is the equivalent of approximately 1 teaspoon of powder gelatine.